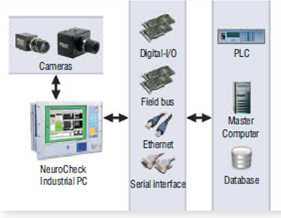 ﻿ NeuroCheck Machine Vision Software from FSI Technologies. NeuroCheck is the leading system for automated visual inspection. As a standard PC based windows application for machine vision, it offers rapid deployment on manufacturing lines through its unique manual and automatic operating modes. NeuroCheck is icon-based which makes it very simple and easy to use while still offering comprehensive functionality through a diverse range of application areas. A "check routine" is created for the inspection of the parts through the manual mode of NeuroCheck. Icons are simply appended in sequence to create the inspection procedure; users of the system do not need to be programmers or experienced PC users. Most engineers with experience of a common Windows package such as Word or Excel can pick up the procedure. The system is then placed in automatic mode for 100% inspection of every component. Many applications can be realized in a matter of minutes through the NeuroCheck wizards. In short, NeuroCheck is complete machine vision software which combines extensive capabilities and trusted, time tested reliability into a single, user-friendly product. We offer it both as the engine for factory built machine vision units and as a separate software product. Call FSI and speak to one of our vision engineers to see if NeuroCheck is the right choice for your machine vision application. Initial consultations are complementary. For more information about these types of applications, and detailed case studies of specific applications, see the NeuroCheck Applications page. 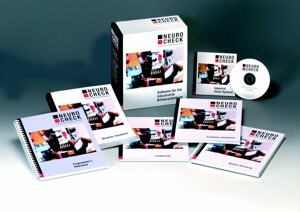 Check Routines- The check routine is the fundamental element in NeuroCheck. It comprises the complete visual inspection of one work piece. A check routine typically consists of several individual checks inspecting different aspects of the work piece. The final result of a check routine, i.e. the statement, whether the work piece is good or faulty, is derived from the results of the individual checks. Modes of Operation- In “Manual” mode, you construct check routines, set check function parameters and test the inspection. In “Live Image” mode, the NeuroCheck window is used to display the live camera image. User Interface- The user interface has been designed with two goals in mind: making the use of digital image processing as simple as possible while giving the experienced user full access to all features. This has been achieved by a highly automated configuration system combined with intuitive control elements for the comprehensive set of options available. Cameras- NeuroCheck supports a large number of the latest digital cameras compliant with FireWire and Gigabit Ethernet standards. Machine Vision Functions- The software encapsulates thousands of powerful and long proven machine vision functions of the NeuroCheck image processing library. The check functions are logically grouped into categories such as image capturing, image pre-processing, machine vision analysis and measuring. Service Packs-No software is ever really finished, there are always new ideas, enhancements... To keep you up to date with the development of NeuroCheck, the latest version is available for download from this page. Run Time- the cost-effective solution for system integrators. Professional- The comprehensive tool for fast and convenient configuration of image processing systems. Premium- The integration framework for advanced users, extensible through your own add-on functions.